Thinking of a holiday to Botswana? Here’s what you need to know! Also in Botswana’s favour is the negligible time change – it’s just GMT + 2 hours. For those seeking some R&R pre or post Botswana safari we recommend the beautiful river lodges close to Victoria Falls but there are additional options, depending on budget, for example you can combine Botswana and South Africa very easily. If you are looking for pristine wildlife areas to explore with very few other guests and vehicles, along with quality guiding and lodging then Botswana delivers. This is a destination which prides itself on low density, high quality eco-tourism. Travelling out of high season (the dry winter months of July to September when wildlife densities are at a peak) will give you access to lower rates. Best rates and availability can be found during the Green Season (lush summer months of December to March), although not all camps are open throughout this period. 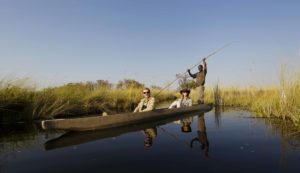 5 day fly-in to the Okavango (ex Maun), staying at two different Ker & Downey camps from £1750 per person. 7 day Desert & Delta fly-in safari (ex Maun) including the Kalahari and two camps in the Okavango from £2,625 per person. 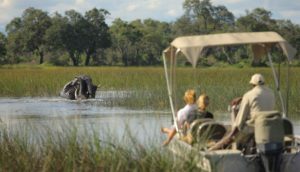 10 day Under One Sky trip (ex Maun) including two camps in the Okavango, Chobe and Victoria Falls from £5,535 per person. 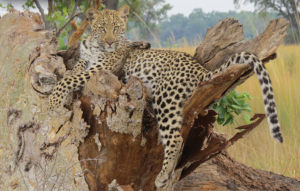 12 day African Bush Camps Cross Border trip (ex Victoria Falls) including Hwange in Zimbabwe, Victoria Falls (Zambian side), Chobe and the Moremi (Botswana) from £3,995 per person. Safari packages are all-inclusive, from food and drink, activities and guiding to your laundry so the cost of your holiday is all paid before you leave home. You can see further sample safari itineraries and explore price guides here. 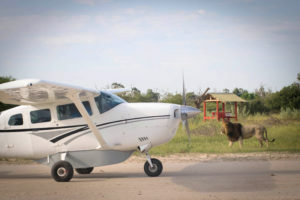 Botswana’s reputation for exclusivity comes largely down to accessibility – small luxury camps/lodges hide away in wonderfully remote locations and many are only accessible by light aircraft/helicopter, either from the main gateways of Maun and Kasane or as inter-camp transfers, which we arrange for you as part of a safari package. There are currently no direct flights to Botswana – the vast majority of our clients fly direct to Johannesburg in South Africa, from where there are good reliable connections with SA Airlink on to Maun or Kasane. As a very rough guide, you should budget c£675-£1100 per person for economy flights via Johannesburg to Maun, depending on season, availability and special offers. It is also possible to arrive into Victoria Falls with c3 hour road transfer to the Chobe lodges, via Kasane. Because Chobe is accessible by road it is the most popular (and the most economical) of Botswana’s key attractions. Visitor numbers are strictly limited in private concessions. Individual camps normally have less than a dozen or so camps/rooms. This means very few vehicles, minimal erosion/vehicle tracks in the bush and little environmental impact. These factors all contribute to the quality of guest safari experience. Botswana has enjoyed more than 50 years of independence and in this time it has stood out for its consistent commitment to conservation and eco-tourism, particularly in the last decade with the leadership of President Ian Khama. 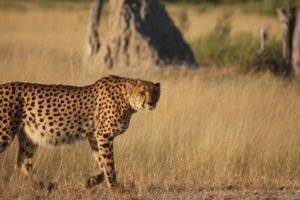 Khama, a keen conservationist, introduced a ban on sport hunting in 2014 to help safeguard large species, however the policy is being reviewed by the new President. Botswana has shown that given space and safety, rare species thrive, including critically endangered black rhino, wild dog, black maned Kalahari lion, lechwe, puku, sitatunga, pangolin and aardvark. The ambitious rhino relocation to the Okavango Delta is just one compelling reason to travel to Botswana. 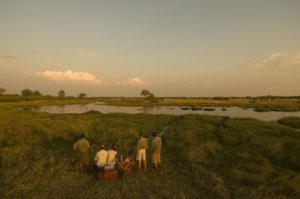 The Moremi Game Reserve on the eastern edge of the Okavango Delta, the world’s largest inland delta and the 1000th UNESCO World Heritage site, is now a place that guests can see all the Big Five once again thanks to the efforts of conservation partners. It’s a real privilege to be able to observe black rhino in the wild with only around 5,000 remaining in Africa. Guests can add a new dimension to their travels by enjoying a behind-the-scenes conservation experience – at certain camps it is possible to meet rhino monitoring teams to learn more about the rhino’s return to the Okavango. Through our Explorers against Extinction charity campaign we have supported the work of Rhino Conservation Botswana, funding and equipping two rhino protection dogs, Primaa and Savas. 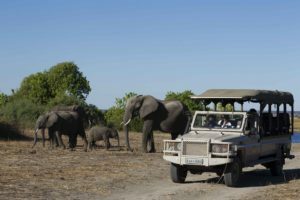 A fantastic diversity of activities from 4×4 game drives, by day and night, to walking and horseback safaris and boat excursions help guests get under the skin of Botswana. Float serenely by mokoro down the Okavango Delta’s maze of papyrus edged channels, safari in Chobe National Park, dubbed ‘Land of Giants’ where more than 120,000 elephants roam, canoe the remote Selinda Spillway, fly camping on deserted islands as you go, walk with San Bushmen in the desolate Kalahari, the largest, most remotely situated reserve in Southern Africa, marvel at magical starry southern skies, visit the mysterious Savute region or witness the zebra migrations from the Chobe River and the border with Namibia to Nxai and Makgadikgadi pans, the longest-known terrestrial wildlife migration in Africa. The ideal safari combines both desert and delta experiences. 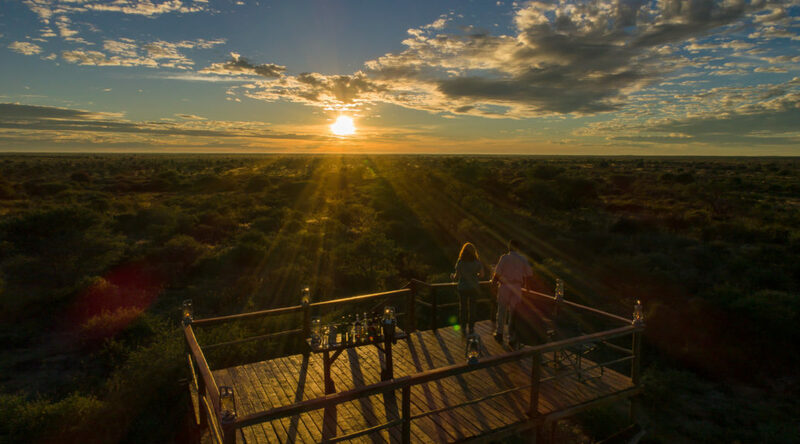 The vast Kalahari Salt Pans include Tau Pan, Nxai Pan, Makgadikgadi and the Central Kalahari Game Reserve. As a general rule these areas start to blossom following the summer rains which tend to arrive in November/December time and last until March. 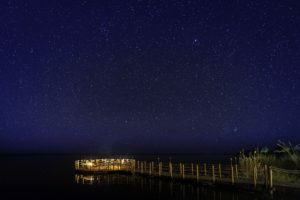 The Delta encompasses the Okavango, Chobe and Moremi and can be visited year-round although wildlife densities peak in the winter months of July-September as the water sources dry up. Most of our guests travel between April and October. Chobe is split into three main areas (Riverfront; Savuti and Linyanti). The Riverfront and Forest Reserve (above the river) can be accessed very economically by road from Kasane (as noted above). Most other destinations are accessed by light aircraft transfer. To explore a whole range of different safari holidays in Botswana, as well as those combining Victoria Falls in Zimbabwe/Zambia with Bostwana please click here. There are many different camps/lodges – you can stay in seasonal mobile camps with a real stripped back ‘explorer’ feel, permanent tented camps or more traditional lodge style accommodation with thatched/reed roofs, doors and windows – some of these will also offer air-conditioning. Combining the camps/lodges of one ‘brand’ into a circuit tends to offer best value – these include but are not limited to Ker & Downey, Kwando, Desert & Delta, Wilderness, Great Plains, Under One Sky, African Bush Camps, Machaba. What’s new in Botswana going into 2019? Splash Camp opened in 2018 and is the newest addition to the Kwando family of camps (Lagoon, Lebala, Kwara, Little Kwara). Ker & Downey’s Kanana Camp will re-open in April 2019 with a brand new look. The camp is currently enjoying a refurbishment. 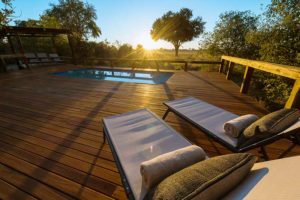 Dinaka opened in 2018 giving guests the option of combining properties in the Okavango (Okuti, Kanana, Shinde) with the Kalahari (Dinaka). Wilderness has been busy expanding and enhancing its portfolio in Bostwana, particularly its Premier Camps. Jao Camp is the latest to receive a makeover and will be upgraded complete with new Jao Villas, opening in June 2019. Mombo/Little Mombo unveiled its brand new look last year in addition to luxurious King’s Pool, Linyanti. At last count there were over 20 Wilderness camps in Bostwana giving incredible choice at this luxury level. Machaba Safaris are a new addition with Machaba, Gomoti Plains and Sable Alley. 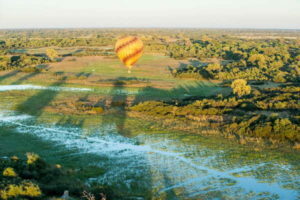 Hot air ballooning is brand new for the Okavango, from Kadizora Camp. 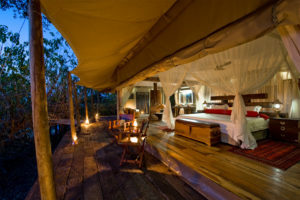 We also have some fantastic new family safari options including a trip with Kwando, staying in family configured tents. Other family options include Desert and Delta and Ker & Downey (both offer 2 bedroom tents/units). These are great for families with children over 7 years old. Explore Botswana in more detail using our information pages here. To see our excellent client reviews please click here. The Okavango Delta in Botswana is a huge and unique inland river delta. The Okavango River flows into a low-lying and very flat area which has gradually silted up with sand from the Kalahari Desert. The Okavango River originates in Angola but it never reaches the sea. Due to the large, flat and shallow area it drains into it ends up being held far away from the ocean. Some of the water drains into the Makgadikgadi Salt Pans creating a home for thousands of flamingos but most of it evaporates. There are larger river deltas in Africa on the Nile and the Niger but they feed into the sea unlike the Okavango. This makes the Delta a totally unique place with awe-inspiring scenery unlike anywhere else on earth. The place is also very distinctive in that it changes dramatically from season to season, from one extreme to another. Every year in the spring the delta fills up with over 11cubic kms of water which spreads across an area of approx 10 square kms. The water comes from the rainfall over the Angolan highlands and peaks from June through to August during Botswana‘s dry months when the rainfall has dispersed across the delta into lakes, rivers and marshlands. This huge amount water over a huge area creates a unique environment for both flora and fauna in this southern African nation. As the waters recede the landscape changes dramatically as it dries out and the animals and plants have to adapt to fit the changing environment. When the water levels are at their peak, the grazing is lush and the Delta provides one of the biggest concentrations of wildlife in Africa. 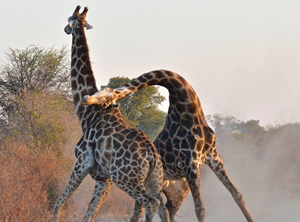 The Moremi National Game Reserve was set up to protect the area and its wildlife and it provides a fantastic wildlife experience for visiting tourists. Most visitors stay in the small, privately owned game lodges spread throughout the area. These tend to be small and exclusive with low environmental impact and only a handful of guests at a time. 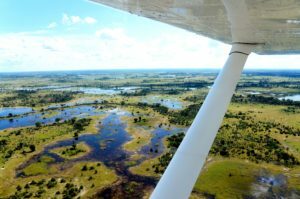 One of the best ways of seeing the Okavango is from the air in a small airplane. The views are spectacular and this unique geographical attraction is mind-blowing in its scale. The delta itself is an anomaly as the surrounding landscape of Botswana is dry and arid. The other great way of exploring the Delta is by mokoro the traditional dug-out canoe used by local for getting around. This way you are right down in on the surface of the water and you get up close and personal to the animals at this level.